Captain Scott Reaches the South Pole, 1912. 036. 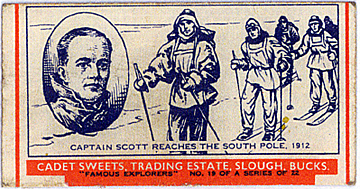 CAPTAIN SCOTT REACHES THE SOUTH POLE, 1912 Issued by Cadet Sweets. (1960). Card number 19 from a set of 22 entitled "Famous Explorers". Size: Ca. 1.4" x 2.75" (cut from packet).